Vincent entered the Order at the age of 17, ignoring, but not without pain, the insistent pleas of his mother that he should not go. His formation started with studies in logic, forming the rational mind, followed by the natural sciences, then on to Scripture study, opening him to the wonders of Divine Revelation, and finally to Theology to fit him for the contemplation of God. The sanctity of St. Vincent hung, then, on a carefully structured framework of the knowledge of God. Yet he was no dry intellectual. His life was bathed in the miraculous. Miracles became so common in his life as to make one feel that a normal day was, for him, miraculous. How can this saint of over six hundred years ago, scarcely living in the world of men, yet making such a concrete impact on it, be imitated? 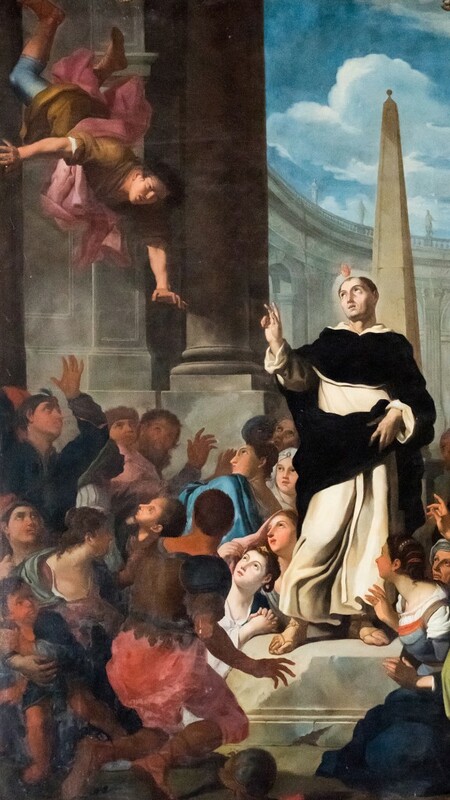 How can the Dominican of today follow a saint who wore a hairshirt, ate very little, led whole troops of flagellants, customarily ended his sermons with a miracle and converted whole populations? Raised on the saintly teaching of St. Thomas Aquinas and zealous for the great end of the Order, the salvation of souls, St. Vincent teaches the Dominican how to live his or her vocation to the full. The Dominican ideal is embodied in St. Dominic, and St. Vincent clung to this ideal. There could be no St. Vincent without St. Dominic. How did he resemble our blessed founder? It is interesting to note that descriptions of St. Vincent’s physical appearance are quite similar to those of St. Dominic. Both are described as medium in height with handsome faces, fairish coloring and large, beautiful eyes. Yet the most important resemblance between the two is the quality of priestliness that encompassed their whole being: Dominic and Vincent were priests of Jesus Christ. Fra Angelico portrays St. Dominic, full of wonder and devotion, at the foot of the Cross. There is also a painting of St. Vincent being embraced by the Crucified. It represents the moment when, after one of Vincent's long meditations on the Passion, he asked Our Lord if it was possible for Him to have suffered so much. Our Lord answered “Yes, and more!” then detached His arms from the Cross and bent over the friar. The love which was exchanged in that moment was hidden from the understanding of others, but its fruits were evident in Vincent's urge to preach Christ across Europe in the wake of St. Dominic. By Sister Mary Martin, O.P.